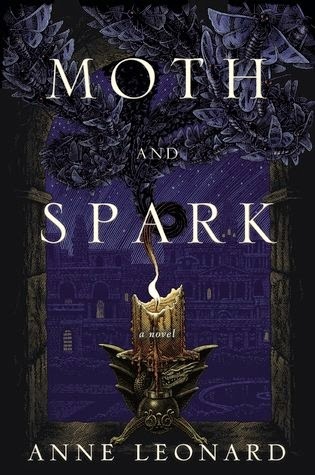 Moth and Spark instantly grabbed my attention with its gorgeous cover. Then, I heard “adult fantasy” and “dragons”, and that made me want to read it even more. The novel will either work for you or disagree with you early on, which will determine how far into it you get. Even though it wasn’t what I was expecting, I liked it. When I think fantasy, I think adventures. I think battles. I think magic. I think friendship and kinship. And perhaps, of course, there will be romance involved, but only secondary to the main plot. More often than not, fantasies have slow starts since the characters, the situations and the setting have to be properly laid out to tell the story in the best way possible. This was my mindset going into this novel, in case you were wondering. It is probably the reason I didn’t mind how slowly things fell into place. I had accepted that it might take some time for me to learn enough about the characters, the kingdom and the history to really get into the story, and it definitely made a difference. I was a little more patient, and a little more intent on analyzing everything being presented in the first few chapters. There is a lot of information, plus heavy amounts of description, and if that’s not your cup of tea, you’ll probably struggle a bit here. Things start to get interesting the more we get to know the two main characters in this novel – Corin and Tam. Corin is the prince, the one determined to keep his family’s kingdom afloat, the one chosen by the dragons to free them. Tam is a commoner come to court for the first time, whip smart, level-headed and bookish. I generally preferred Tam to Corin, and not just because she’s a woman. Her thoughts, opinions and actions are absolutely fascinating, and it didn’t take long for her to win me over. Corin, on the other hand, seemed uninteresting initially because he was just your typical heir to the throne strategizing how to win a war. But his personality is slowly revealed, and there’s definitely a softer, more vulnerable side that was truly appealing. Both characters are loyal, brave and dedicated to fulfilling their duty, no matter how hard it was, which was why their relationship worked so well. Moth and Spark surprised me by having a heavy focus on the romantic relationship between Tam and Corin. The beginning of their relationship had me rolling my eyes quite often, since it felt so contrived. It certainly felt a little too instantaneous to be taken seriously (with lines that definitely felt insincere and silly), and I nearly gave up on liking the romance. Little by little, Leonard shows us why we should like these two together (with a few admittedly sweet moments) as the story continues. While they won’t win couple of year with me, I could understand why Corin and Tam were so drawn to one another. The adventure only really kicks in towards the latter third, including the presence of dragons and epic fights and magical demonstrations. The stakes are high, and sacrifices must be made to help Corin complete his mission to free the dragons and to save the kingdom. The intensity and significance of Corin and Tam’s respective roles is truly emphasized. I’m actually surprised at how invested I was in the outcome, considering I wasn’t fond of the romance and thought the start was a bit dragging. But I was, and that helped make this last bit pretty strong overall. Still, I can understand why Moth and Spark didn’t work for a few of my friends. It starts real slow, taking some time to build up the characters and their world in chapters with heavy descriptions and barely any dialogue. Plus, the romance takes its sweet time to become believable and worth rooting for! But it was worth reading, for me, to get to the point where the sort of story I was hoping for emerged. My opinion? Try the first few chapters, see how you feel and then decide where to go from there. That’s just the type of novel Moth and Spark is, really, and it’s more a personal preference whether to read it or not. I honestly had no idea what this book was about. SERIOUSLY excited now to find out that it's fantasy and dragons! I mean, rock on! I will definitely have to give this one a try; really hoping it ends up working for me! I hope it does too! I just really think if you go into it with the right expectations, you'll enjoy it a whole lot more. I was underwhelmed, but only because I was kind of expecting something else. Hope you like it! Dude, I've been thinking about this book and going back and forth because like you, the words adult and fantasy are pretty epic. I wouldn't mind that the romance is the focus but if YOU weren't totally feeling it, I'm not sure...I might do what you said and read the first few chapters and see how it goes. AMAZING review though, A! I loved it! Thanks, K! Honestly, I feel like it's a very subjective thing. You'll know if you want to read it or not based on a couple of pages, so definitely do that. I do have to admit that the change in pace from YA to adult was pretty nice though. I was one of those people who just didn't "get" it! :( I'm glad you stated all sides of the book because I know it really, really worked for some people. I didn't like the relationship aspect and it was really frustrating to me. It just really turned me off and I wished things were more mixed instead of romance romance romance romance romance ACTION. Thanks, B! I was frustrated by the romance as well, especially since I wasn't expecting it to be the main focus of this book. If there had been a better balance between romance, action and lore, I probably would have loved this book so much more. I'm always looking for that next fantasy novel to wow me and this sounds like it could be it! :) Going in knowing it will be a slow start is very helpful.